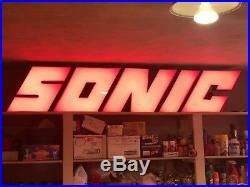 Vintage Original Sonic Drive-in neon sign. Measures an awesome 7 feet long by 17 inches tall by 12 inches deep. Plugs in to regular 110 outlet and lights up great. Its in fantastic shape for its age – displays superbly. This was the sign that the servers would roller skate out from under to serve the cars at the drive in. A fantastic addition to any fast food, sign, car, gas and oil etc collection. Thanks for your interest! 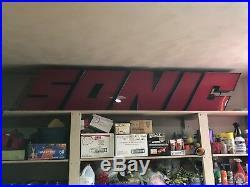 The item “Sonic Drive-in Neon Sign Vintage Original” is in sale since Thursday, December 27, 2018. This item is in the category “Collectibles\Advertising\Soda\Coca-Cola\Advertising-Print”. The seller is “ryanericlazar” and is located in Dearborn, Michigan. This item can’t be shipped, the buyer must pick up the item.